Home > Throat Surgeries > What is an Adenoidectomy? An adenoidectomy is a surgical procedure that is carried out to remove the adenoids. It is not necessary for everyone and will only be removed if they are causing many problems for the individual. 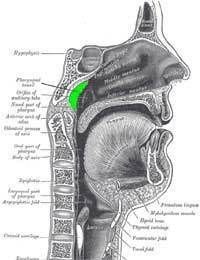 The adenoids, also known as the pharyngeal tonsils, are small collections of yphoid tissue found at the back of nose (the upper end of the throat). As they are made up of lymphatic tissue they are considered to play a very minor role in the immune system, though their importance in today’s society is questionable. Of those who have had their adenoids (and often the tonsils) removed, there seems to be no adverse effects and their removal only seems to serve the individual in a positive manner. Why Do They Need Removing? There are many reasons why the adenoids may need removing with the most common being because they become enlarged and cause problems. The adenoids may become enlarged because of infection, often beginning in the ears and because of inflammation and a build up of fluid. They can become enlarged enough to interfere with breathing particularly when asleep and can result in snoring or worse, sleep apnoea during which breathing ceases temporarily. Recurrent throat and ear infections which are both very common in children often cause lengthy absences from school due to long bouts of illness. In these cases, doctors often recommend that the tonsils and adenoids are removed with the aim of lessening the chance of further infections. Single or less symptomatic infections will probably not be treated with an adenoidectomy. An adenoidectomy will most commonly be carried out as a day patient as the procedure does not take long and the recovery is usually quite quick. A general anaesthetic is used and the tissues can be snared, cut out or shaved until adequate amounts of tissue are thought to have been taken. Most adenoidectomy procedures take less than half an hour followed by another half an hour in the recovery room. Recovering from an adenoidectomy can be uncomfortable as swallowing may be difficult at first. It is however vital that small frequent sips of fluid are taken to avoid dehydration. You will likely have a sore throat for the first week which can be treated using paracetamol or similar pain relief and by using salt water gargles which will help keep the throat clean; remember though, not to swallow salty water solutions as they are bad for your health. Bleeding is a small risk and active bleeding either from the throat or nose should be seen by your doctor if it does not subside soon after it begins. If you develop a high temperature following your procedure that does not reduce after taking regular paracetamol, please see your doctor. An adenoidectomy is a relatively safe procedure that usually has a good outcome. It is most often carried out for children as they are the group that suffers with throat and ear infections most often.